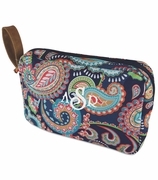 Personalized striped accessory cosmetic bag. A bold black and white cotton tote bag is the perfect choice. You will love the sophisticated stripe blend. The bag opens with a zipper along the top and is perfectly sized to hold all your beauty items or make up. 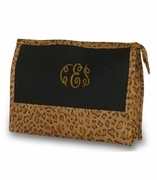 Let us embroider your personal initials in our new accent monogram for a classy finish. Matching items include a tote bag search WB-M885CHAN or duffle item WB-M300CHAN. NOTE.. 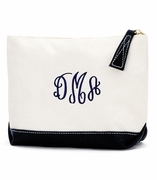 ACCENT MONOGRAM IS APPROXIMATELY 1" AND IS PLACED AT THE TOP OF THE TOTE. Monogram striped accessory pouch measures 10"W x 6.75"H with envelope bottom. Zipper closure.